What Can You Expect from Miami BarkBusters? In-Home. I will come to your home where most behaviors occur and is more convenient for you. Custom Plan. Every dog is different. We will develop one to overcome your dog’s specific issues. Dog Training Lesson. The lesson will last approximately 2 – 3 hours. Homework. Want the best results? Practice what you’ve learned with your dog(s) for 10 – 15 minutes/day. Immediate results.You will see results by the end of the lesson! 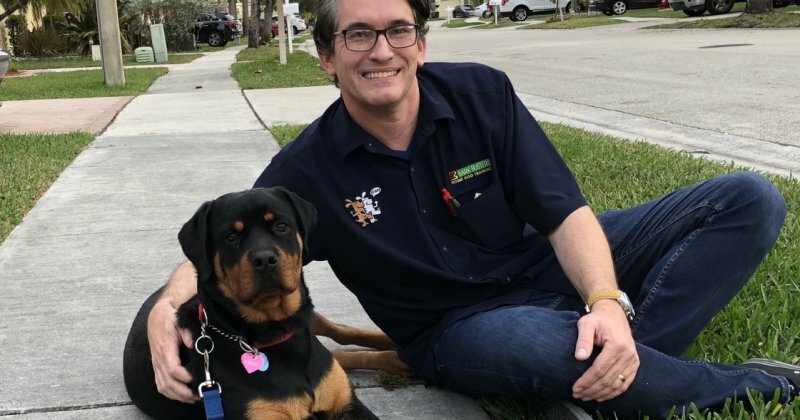 Why Hire Bark Busters Miami? Experience. I have been a Bark Busters trainer since 2002 and Bark Busters is the largest and most trusted dog training company in the world. Convenience. I teach you and your dog in your home where most problems occur and your dog can focus. In English or Spanish. Value. Every training comes with a guarantee of support. Recommended. Bark Busters has been recommended by numerous vets throughout Miami as well other dog trainers with difficult dogs to train. My clients love that I am fluent in two languages – English and Spanish -- But, Dogs don't understand English any better than Spanish, Portuguese or Russian. Why? They simply don’t speak our language. They just speak Dog. and not having a clear communication can add stress, anxiety and frustration to your relationship. I will work with you, at your home on how to effectively communicate with your dog without having to use food or physical methods (no prong, electronic or shock collars) and you will learn how to use your body language and voice tones in a way that ultimately lead to a fun, happy and well balanced relationship. In no time at all, your dog will begin listening to you and you’ll have the obedient family dog you have always wanted. I graduated from Medical School at 21 and while I was doing my Masters in Sports Medicine in Australia, I was introduced to my wife, a fellow dog lover, and to Bark Busters Home Dog Training. We then, 16 years ago, decided to bring this revolutionary concept to Florida. I am often asked why an MD, with 2 Master’s degrees, is a Dog Behavioral Therapist for Bark Busters and the answer is simple: I just love dogs and helping people, Bark Busters does both. From a Medical point of view, I can customize the training for dog owners with disabilities or special needs in a way that is realistic for you and your dog. I know I can help you. Please don't give up on your dog without working with me first, especially if other methods have failed. Call Miami Bark Busters and Luis Escobar today! Visit my personal website Dog training Miami Florida. Luis has been extremely helpful with Roxy! She has improved already (after only 1 lesson). Luis is an excellent trainer and really understands dogs. I would recommend Bark Busters and Luis to friends or family having trouble with their pup. Thank you for all your help! Luis Escobar is the best! This man saved my and my dog Chloe's life. I was at my wits end and he came in and immediately answered all my questions and solved my dog's behavioral problems. I just can't recommend him and Bark Busters enough!! Luis was awesome! We highly recommend working with him and Bark Busters if you are experiencing any kind of issue with your dog. Within a day we have a brand new puppy! Its incredible to see! THANK YOU LUIS AND BARK BUSTERS!!!! Luis was amazing with our beloved dogs ,the way he explained what and how the training would go. The dogs responded very well to what Luis was trying to show us and them. Now we just have to reinforce what Luis showed us.LOVE Bark Busters thank you Luis.